Scleroderma Awareness Month: Hard Word. Harder Disease. Every year I get a note from the Scleroderma Foundation about Scleroderma Awareness Month. Take the pledge! Tell at least one person about scleroderma! Coerce your friends into joining the walk for the cure later this month. Piece of cake. I can do that. Hand on to your phones, because here we go. Scleroderma is a crazy sounding word, isn’t it. It is actually descriptive of the most obvious symptom of the disease: based on Greek words, “sclero” means hard and “derma” means skin. Hard skin. My skin is interesting to say the least. Hard, shiny, speckled with white patches of scaring, tight across my cheekbones and knuckles: kind of typical for the disease. Best advice ever for the scleroderma girl. This same connective tissue is also found throughout the intestinal tract, and in many other organs of the body. The lining of blood vessels also is impacted, and there is a lot of smooth muscle (like the muscles that work in your stomach) damage. Some people with scleroderma will only experience it in their skin, but others will have damage occurring in organ systems of their body. None of this is nice; some people will lose the function of their hands, while others suffer kidney, heart, and lung damage. Intestinal tract damage is almost universal, and some of these complications can be severe. Check out this neat interactive chart of symptoms. So, what causes scleroderma? The actual answer is… nobody knows. It is an autoimmune disease that is triggered by unknown causes, has no cure, and if left untreated in the systemic form is fatal 50% of the time. Right now there is no drug to directly treat the disease, but there are treatments to help with symptoms and to modify the course of the disease by impairing the immune system. With these drugs survival rates are way up. Seriously, hug the next scientist you come across. I personally plan to throw a bar-b-que for the next one I get my hands on. As it turns out, this year the month of June arrives at a pivotal time in my scleroderma life. There is so much going on, and so much that I’m thinking about, that I’m gearing up to post a whole series of articles about the complexities of navigating through the world as a chronically ill patient. Seriously. I could write a blog post for each day of the month. My little notebook that I jot ideas for posts in is filling up quickly. I need a catchy title for the series. It will be about science, biology, medical decisions, and navigating through a world of alternative medicine and treatments. You know, like fake news, but instead we are dealing with fake medicine. Whatever is a scleroderma girl to do? Stay tuned. I’m seriously gearing up for this. June is going to be a great month. 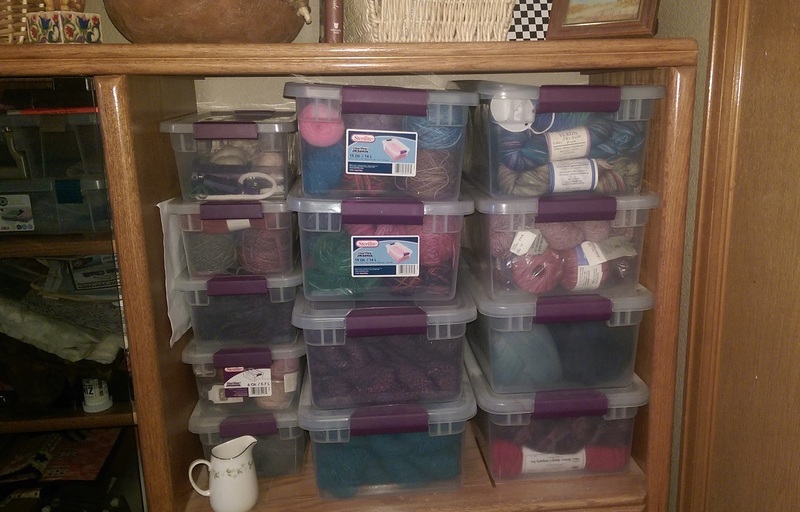 Author Midnight KnitterPosted on June 2, 2018 Categories Knitting, science, SclerodermaTags autoimmune disease, chronic disease, scleroderma, Scleroderma Awareness Month, systemic sclerosis2 Comments on Scleroderma Awareness Month: Hard Word. Harder Disease. It seems like I just wrote a “rare disease day” post just yesterday, but it has been a whole year already. Actually, I think that I was really lazy last year and just re-posted the previous year’s blog post. Anyway, tomorrow (February 28th) is World Rare Disease Day. This year the motto is “Show Your Rare”, which is a little scary as it sounds vaguely like how I might order my steak, but I’m game. I’m rare, and here is my story. First things first. Let’s talk about rare diseases. Here in the United States, a rare disease (also known as an orphan disease) is one that affects fewer than 200,000 people in the US. The bad news is that there are a lot of rare diseases; over 6,000 different diseases that impact about 25 million people just here in the US. Many of these are genetic in nature, and they tend to be chronic (more about that later). I joined the rare disease club the day that my systemic sclerosis (a form of scleroderma) was diagnosed. With only about 100,000 cases in the US, we are definitely rare. Here’s the scoop on my disease: it is progressive, disabling, chronic, and possibly fatal. It shares some characteristics with cancer cells. It is also mostly invisible to other people, and people have no frame of reference to understand an illness that they have never heard of before, so they tend to be dismissive. One of the most obvious features of my condition is my thick skin. My legs and lower arms are literally hard, and here on my hand you can see that the skin folds kind of strangely. My skin is thick with scar tissue that has built up in response to inflammation set off by my immune system’s attack on normally healthy tissue. You can really see it on this finger. My finger looks pale since the scaring is so bad it cuts off circulation when I hold it out straight. There is a silver lining to this: I will never have “old lady” hands. My hands look strange, but I am doing really well all things considered. I have good circulation and flexibility which my doctors think is due to knitting. “Knit as much as you can!” was the recommendation. See, every setback in life has a silver lining. What can’t be seen is my astonishing fatigue, muscle/joint pain, and brain fog. So much brain fog. I’m also accumulating organ damage as the months pass by. Digestive system damage, kidney damage, lung damage, and blood vessel damage that is slowly increasing the pressure in my heart. All that redness on my face is due to blood vessel damage, and you can see the thick skin around my eye. Collagen build-up has given me chipmunk cheeks. Special. Thank heavens for red-cancelling make-up. It’s like a scene from the movie, The Terminator. You know… if you substitute this line about the Terminator from the movie with the word scleroderma it would be… [Scleroderma] can’t be bargained with. It can’t be reasoned with. It doesn’t feel pity, or remorse, or fear! And it absolutely will not stop, ever, until you are dead! Mortality rates are down for my form of the disease due to new drug interventions. The other good news is that it is moving really slowly in my case. I think that I have had this disease for decades, and only now, in my 60s, is it catching up with me. I’m on the best drugs available, I love my doctors, and they have slowed the disease progression down tremendously over the last couple of years. But I’m still dealing with a serious chronic illness, as are many other people with rare diseases. For me, when trying to explain my illness to others, it is the concept of “chronic” that causes the most trouble. People tell me to get more sunshine, more exercise, better food, use essential oils, whatever, so that I can get better. That’s the way it is for many health conditions, but not for a chronic illness. There is no better, I tell them. Only this. Nope. They will insist that I can get better if I just try, and take it as defeatism when I calmly explain that some of this damage can’t be reversed. It is possible to get better without getting well, they will say. You look so great! It’s like it’s a personal affront that I can’t just be cured. If they haven’t seen me for a few months they will express surprise that “this is still going on”. It is the concept of “chronic” that is the problem. To accept that you are sick is not weakness or “giving up”. It is coming to terms with the nature of your enemy. So here is my Rare Disease Day request for anyone who has managed to read all of this. Accept chronic. Ask the person you are talking to about how they are doing. Ask what their doctors are telling them. Accept that they are in a situation that they can’t escape from. Don’t shy away from the fight if you care about that person. If you know the movie “The Terminator“, you know that the heroine of the tale, Sarah Connor, was a hell of a fighter. She never, ever gave up, and in the end she got the best of the monster trying to do her in. Life is Uncertain, Knit Fast!! Yesterday was Thanksgiving. A time to be thankful for the good things in life. I have always thankful for good health in the past. This year, for the first time, that wasn’t true. There can be no doubt about it. Things hadn’t been quite right for a long time. My joints hurt. I had a rash on my face. I sometimes had trouble swallowing, and acid reflux was occurring on a regular basis. My hands were swollen and I had trouble moving my fingers. Fatigue was my constant companion. If my hands got cold my fingers turned white or purple, a condition called Reynaud’s. Sometimes it hurt to breathe. I kept thinking that if things got worse I would go to the doctor, but I never became so sick that I could justifying taking off work. As many people with chronic conditions do, I just made adjustments and kept going. Then, without any warning, my digestive system rebelled in a big way over the course of one weekend in early May. Colitis? You have got to be kidding me! Feeling pretty uncomfortable I kept close to home and worked on landscaping projects outside, read books, and worried. After two weeks I contacted my doctor. Tests were ordered. Everything was negative: there was no obvious infection. Relieved, I decided to just give things a little more time. There was one test result that did nag at me, however. My renal function was a little low. Alarms went off in my head. Lupus! I called the doctor’s office and scheduled an appointment for an exam to be evaluated for lupus. Good grief! 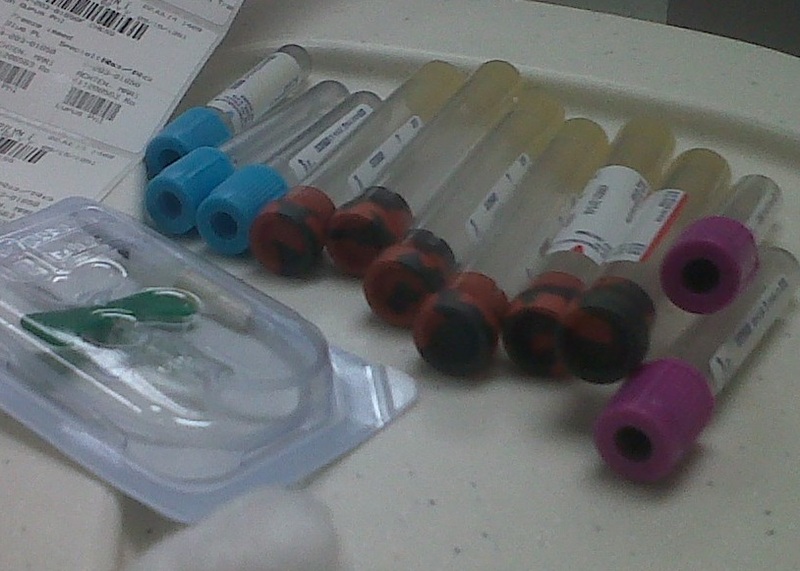 This is how much blood was drawn to do my rheumatology testing! “How is it possible that you haven’t already been diagnosed?” my doctor asked me. How indeed? Oh yeah. That adjusting and just keep going thing. She ordered a huge battery of tests for a comprehensive rheumatology screening, and told me no more gluten in case it was celiac disease. I was horrified. Celiac disease! I wasn’t prepared for that! “Celiac disease would be good,” she said. “We can treat that.” Believe it or not, at that moment celiac disease seemed like the end of the world. I left her office in a sad condition and counted the number of tests ordered while heading down the stairs to the lab. Twenty-two lab tests. Yikes! Over the next week the test results slowly trickled into the patient portal where I could see them. Everything was coming back negative. Because of the rheumatology research lab job, I had some idea about which antibody test results were linked to lupus. The big lupus markers were all coming back negative. I began to convince myself that I was a big over-reacting baby. Then suddenly a note came from my doctor telling me that she was sending me to rheumatology for a consultation and three tests I hadn’t seen before appeared in my inbox on the patient portal. Positive results for auto-antibodies associated with scleroderma and Sjogren’s Syndrome. 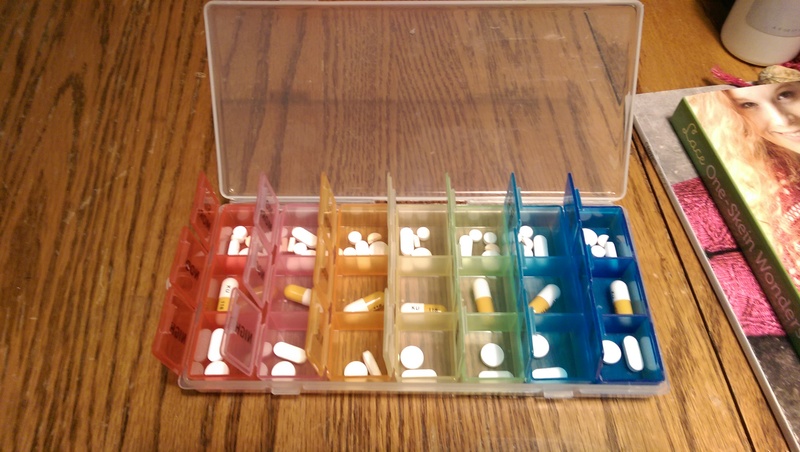 Look at the great pill case that my sister sent me to help me keep track of all these meds! Luckily I am a master of adaptation. That whole adjust and keep going thing has prepared me for an event just like this. Time to knit fast. Knit very fast! Just cast on and don’t look back. Author Midnight KnitterPosted on November 28, 2014 November 29, 2014 Categories Knitting, Life Lessons, SclerodermaTags Anit-nuclear Antibodies, celiac disease, chronic disease, Knitting, Reynaud's disease, scleroderma, Sjogren's Syndrome, Thanksgiving2 Comments on Life is Uncertain, Knit Fast! !